The biochemistry department is located on the first floor of Appleton wing on the Warrington site and operates a satellite laboratory on the Halton site. As the main Biochemistry Department, this is the site that the majority of the GP and Outpatient Work is undertaken, in addition to serving A&E and other wards. It is equipped with a tracked automation system. The track links the main analysers within Biochemistry and transports the samples to the appropriate area for testing before returning them to storage. There are also a number of smaller analysers within the department which are used for more specialised testing. A Lipid (Cholesterol) clinic is held in the outpatients department each week by the consultant chemical pathologist. A dedicated Haemachromatosis clinic is held each week by the consultant. Instrumentation Support is provided by the laboratory to all point of care equipment on site, including those at diabetic clinics. As a satellite laboratory the Biochemistry department at Halton is much smaller and undertakes mainly urgent work. 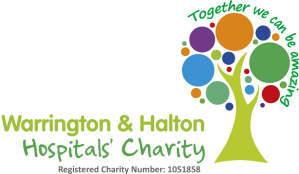 Instrumentation Support is provided to regular diabetic clinics at the Halton site. The programmed investigation unit provides a day ward for patients that need to be admitted for dynamic function tests. Blood is the main fluid of analysis which contains many inorganic ions, proteins, hormones, enzymes, carbohydrates, lipids and dissolved gases, O2 and CO2. These substances are maintained within defined limits in health but the disease process upsets the normal balance of these chemicals and they then become markers of the disease state. We can use these markers to monitor disease and recovery. Chemical testing of biological fluids has proven useful in diagnosing disease of the kidney, liver, heart, lungs and endocrine system. Some cancer cells also release chemical substances into the blood which can be used as diagnostic markers, and once elevation is detected, monitored in relation to treatment. In addition to its diagnostic role, biochemistry supports the treatment of patients receiving intravenous fluid and also in monitoring the concentration of therapeutic drugs to ensure maximum therapeutic effect and minimum toxicity. Most chemical testing is performed on large sophisticated analysers, which can process 200 samples an hour, with an average of 10 different tests performed on each sample (2000 tests / hr). Some analysis is still carried out in test tubes utilising colorimeters and spectrophotometers to measure the intensity of a colour produced by a reaction between the patient’s sample and a specific colour reagent. Recent advancements in Biochemical Instrumentation have facilitated the introduction of Point of Care testing. Certain tests can now be performed on miniaturised equipment at the patient’s bedside which may allow immediate diagnosis and treatment. The Department of Biochemistry is committed to monitoring the performance of this and all of its systems with regular and stringent quality control processes and participates in a number of National, commercially available External Quality Assessment Schemes. The department is fully accredited by CPA [Clinical Pathology Accreditation (UK) Limited]. 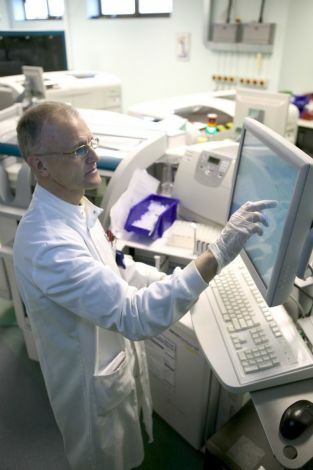 Outpatient referrals are all seen by the consultant Chemical Pathologist. If you have been to your GP and have a unique booking reference number you can log in to the Choose and Book system to view your choices. However, GPs can still refer patients directly to the Chemical Pathologist via a letter, telephone call or a fax. Glucose Tolerance Tests can be booked with the Departmental secretary on the telephone number indicated below.